Karkhane, A., Yakhchali, B., Rastgar Jazii, F., Hemmat, J., Shariati, P., Khodabandeh, M., Zomorodipoor, A. (2012). Periplasmic expression of Bacillus thermocatenulatus lipase in Escherichia coli in presence of different signal sequences. Iranian Journal of Biotechnology, 10(4), 255-262. Ali Asghar Karkhane; Bagher Yakhchali; Ferdous Rastgar Jazii; Jafar Hemmat; Parvin Shariati; Mahvash Khodabandeh; Alireza Zomorodipoor. "Periplasmic expression of Bacillus thermocatenulatus lipase in Escherichia coli in presence of different signal sequences". 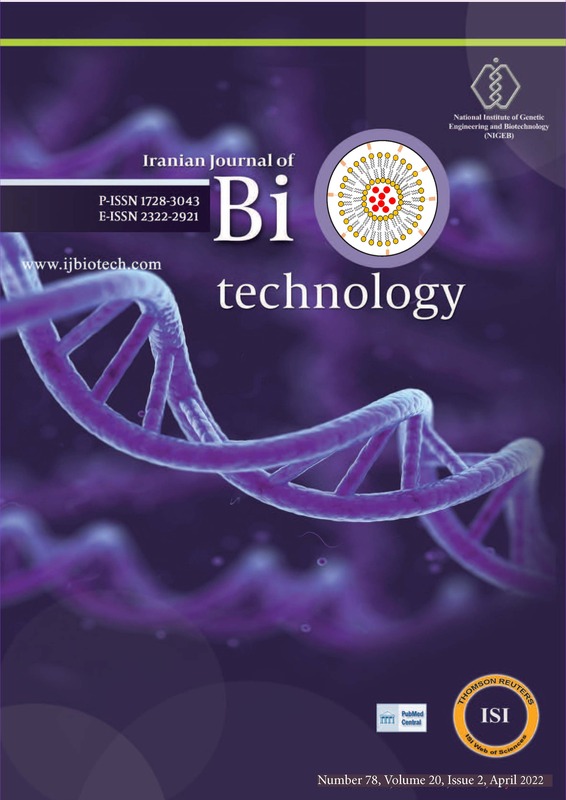 Iranian Journal of Biotechnology, 10, 4, 2012, 255-262. Karkhane, A., Yakhchali, B., Rastgar Jazii, F., Hemmat, J., Shariati, P., Khodabandeh, M., Zomorodipoor, A. (2012). 'Periplasmic expression of Bacillus thermocatenulatus lipase in Escherichia coli in presence of different signal sequences', Iranian Journal of Biotechnology, 10(4), pp. 255-262. Karkhane, A., Yakhchali, B., Rastgar Jazii, F., Hemmat, J., Shariati, P., Khodabandeh, M., Zomorodipoor, A. Periplasmic expression of Bacillus thermocatenulatus lipase in Escherichia coli in presence of different signal sequences. Iranian Journal of Biotechnology, 2012; 10(4): 255-262. 1Department of Industrial and Environmental Biotechnology at the National Institute of Genetic Engineering and Biotechnology (NIGEB), P.O. Box 14965/161, Tehran, I.R. Iran. the pelB, ansB and ansB/asp signal peptides. For this purpose, four recombinant expression vectors (pYRKP.P, pYRKP.N, pYRKP. A and pYRKP.AA) were constructed and expressed in E. coli. Osmotic shock analysis showed that recombinant lipase was overexpressed as inclusion bodies in E. coli. The lipase inclusion bodies were subsequently solublized, refolded and purified using single column ion-exchange chromatography. To evaluate localization of lipase in the cell, the purified lipases were subjected to capillary isoelectric focusing and tandem mass spectrometry. Results showed that all signal peptides were able to direct the lipase from the cytoplasm into the periplasmic space of E. coli, because the periplasmic space of E. coli is not suitable for lipase folding, the translocated lipase aggregates in this space as inclusion bodies.